45° V-Twin, four stroke, pushrod actuated overhead valve. hydraulic self-adjusting lifters, 2 valve per cylinder. Width: 831 mm / 32.7"
The Lightning CityX XB9SX is an urban brawler, designed to rule the city streets with muscle and attitude. Armed with handlebar deflectors and a headlight grille, the CityX rider grips wide, supermotard-style handlebars while the Skyline seat offers an elevated view of traffic ahead. The Thunderstorm 984 V-Twin delivers quick-revving acceleration for the cut-and-thrust of urban traffic. Pirelli Scorpion Sync tires have an aggressive tread pattern for all-conditions performance. New high-impact composite frame pucks protect the frame from minor cosmetic damage. 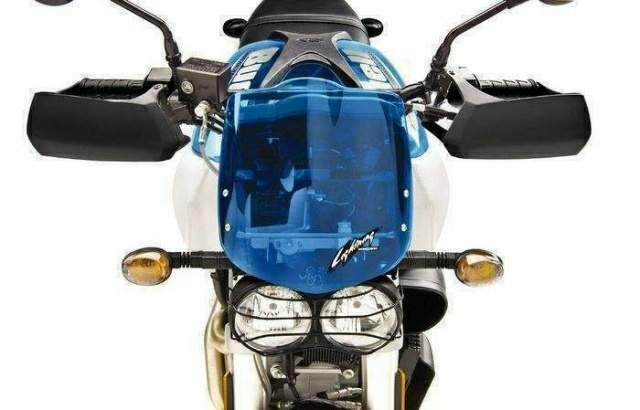 The soft-rubber Buell X Guard helps protect the airbox from tankbag scuffing. The see-through Translucid airbox cover and flyscreen put mechanical details on display, while Villain Black wheels and Midnight Black lower body panels and front fender hide the grime of the city. 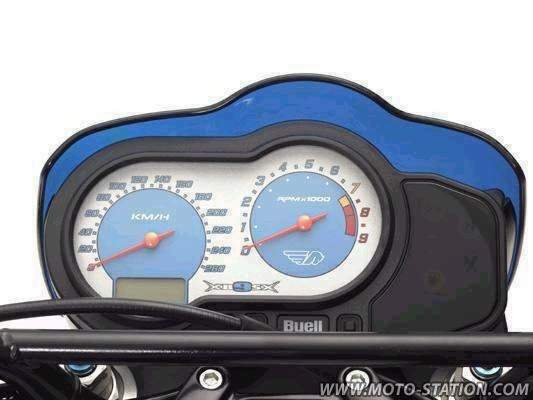 Available for 2006 in Hero Blue Translucid and new Kick Ash Translucid. Late in 2004 we had the pleasure of spending a week with Buell's then new-to-market CityX 900. We liked it rather a lot, to the extent that when the opportunity for a longer term test arose we rather jumped at it. When we got hold of it, circumstances dictated that it got used every day, come rain or shine, for a 35 mile each way drag through the centre of London. Pretty much exactly what it's designed for, then. So how did we fare? Collecting the Buell from Warr's in King's Road was a little like going to collect the family pet from the vet's. That sounds a little odd perhaps, but the character of the bike is very much that of the faithful family spaniel. Happy to play, delighted to see you and equally at ease just sitting in quiet companionship as frolicking around like a puppy. How can a machine have character? It's a fair point. 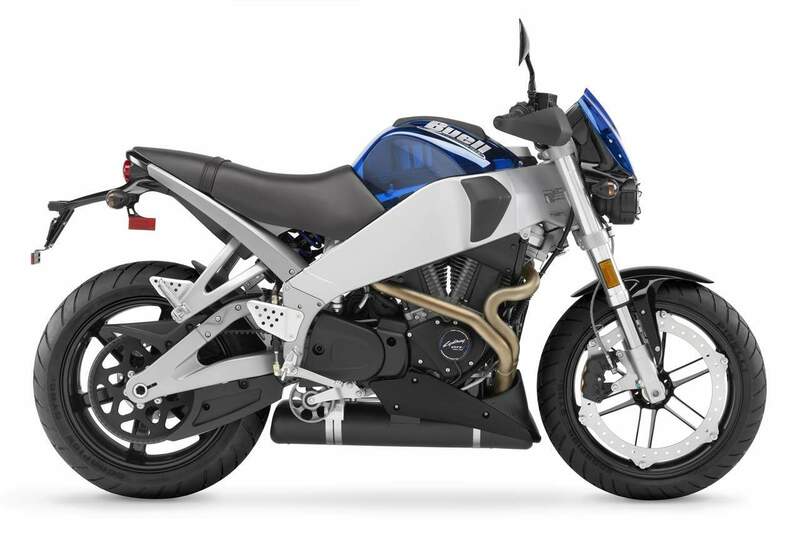 All I can say is that the Buell CityX has such an abundance of personality that it becomes almost impossible not to anthropomorphise and give it human traits. Throwing a leg over reminded me just how small the Buell is, even in this slightly raised version. The high-ish bars still fall perfectly to hand, digits remain happily hidden behind brush guards and the peg to saddle relationship is about as good as it's possible to be. Working my way out into rush-hour traffic, it took about three seconds for me to become totally at home on the Buell and another couple before I started grinning. 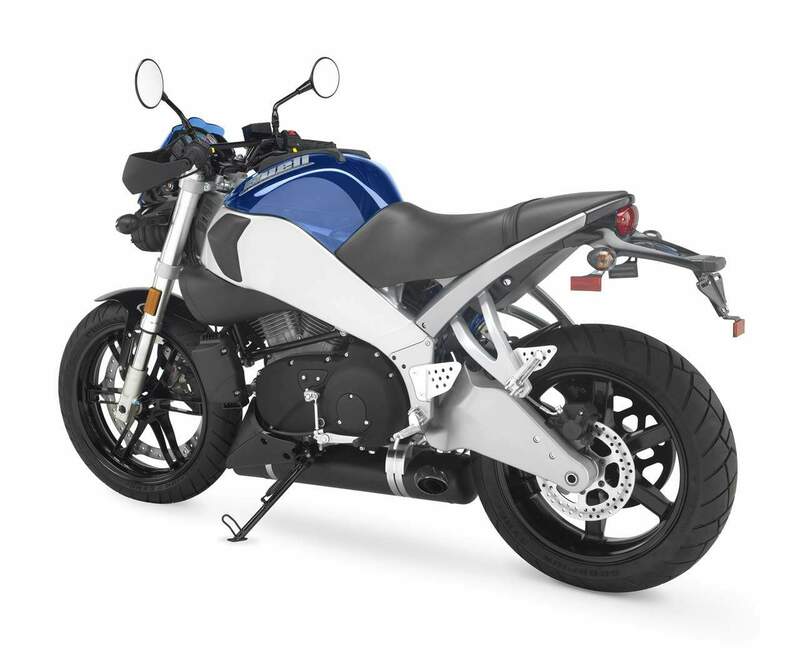 To save you looking back over earlier articles, the Buell CityX is, to all intents and purposes, a 900 Lightning which has been modified to make it more usable in an urban environment. So it has the oil in the swingarm, fuel in the frame chassis with the rim mounted ZTF front disc and toothed Kevlar belt drive common across the range mated with the original 984cc Harley motor that we saw when Buells first came to town. Then Buell added a few tweaks. Riser plates (well, lowerer plates actually) make a little more space between footpegs and seat to improve comfort. Black wheels and lower bodywork conceal city grime while tyres are chunkier to better handle potholes and kerbs. Bodywork is clear blue plastic for no reason at all other than looking very cool, and the roo-bars across the headlights perform a similar function. Brush guards on the bars protect hands against both weather and van door mirrors. The whole thing gives an overall impression of being as mad as a barrel of monkeys and is probably the most fun you, I or anyone else will ever have fully dressed on a motorcycle. One of the delights in riding through town is the opportunity for interaction with other riders it affords you. As a road tester it's a great way of getting the opinion of a whole section of people without having to ask - if the bike is worthy of comment, good or bad, it'll get some. And the massively over-riding response I got from people about the Buell was incredibly positive. Sure, they all thought that a (virtually) 1000cc engine in something the size of a scooter was nuts. Lots thought it was a scooter when they saw it from either end and then needed to try to understand what they were looking at. Everybody thought it was incredibly good value for money if they were crass enough to ask a price. And everyone thought I looked as though I was having a ball. Because I was. Sometimes, very rarely, a company comes up with a machine, normally a car or bike, that just makes the driver or rider smile. It's not necessarily a pride or cost thing - it doesn't have to be the fastest, best looking or most exclusive vehicle ever - there's just something about some vehicles that makes people feel good. That feelgood factor is something that is missing from far too many bikes on the market. Perhaps it has been replaced with mechanical prowess or with clinical efficiency or, as with many new sportsbikes, with barely managed fear. But the Buell, despite being technically advanced in many areas, has that feelgood factor in spades. Every morning, no matter how tired I was, no matter how horrible the weather, by the time I had reached the end of my road I was grinning. Maybe it's the eagerness of engine, belying its ancient design with a rev-happy nature accompanied by a fantastic soundtrack. Perhaps it's the way that it will go on its ear at the slightest provocation, making the Buell possibly the easiest bike ever to turn. Or perhaps it's the way every speed bump becomes your own personal stunt park, the Buell leaping off the top like Steve McQueen making a run for Switzerland. 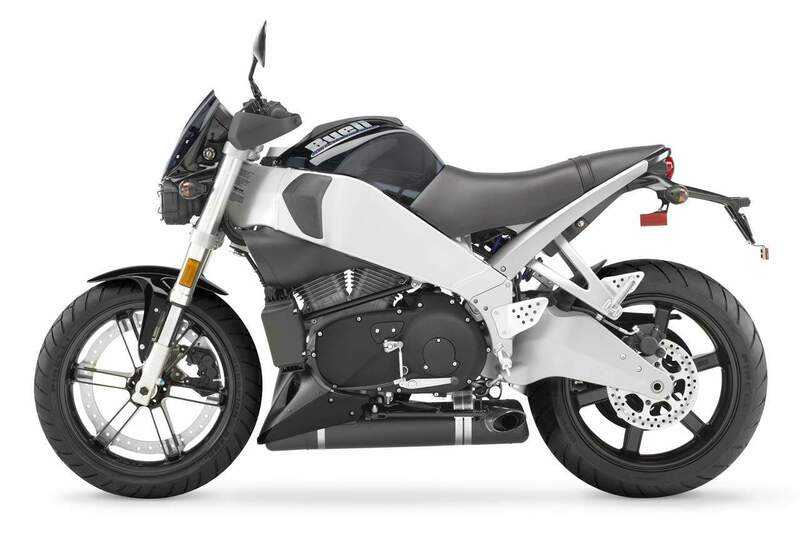 Whatever the reason, the Buell CityX is a bike that makes me smile. And being an unselfish chap I took every opportunity to share that smile, whether by telling everyone who asked what a hoot I was having or demonstrating the Buell's exuberance over speed bumps, mini roundabouts and the like. February is traditionally one of the best times of the year for motorcycling in Britain, with mild, dry weather and long days providing the perfect backdrop to two wheeled shenanigans. Or perhaps not. February 2005 lived up to expectations in many ways, and did in fact give me at least half a dozen nice days to enjoy. The rest of the time, though, it rained. Or snowed. Or, on one spectacular occasion, gave us heavy snow with bright sunshine and thunder and lightning. All at once. What conditions certainly did offer, though, was an opportunity to really check out the behaviour of the Buell in pretty well all weathers. And one of the things I learned quite quickly was that the brush guards not only protect delicate digits against the efforts of White Van Man, they're also rather handy (arff arff) for keeping warm as well. It's lovely being able to wear summer gloves in midwinter. Another major plus came from the tyres. Those chunky Pirellis clear water and snow far, far better than the more overtly sporty numbers fitted to the regular Lightning, and while the tread does squirm around quite distinctly at speed there's bags of feel and the overall impression is of forgiving predictability. Slides, while rare, are easily caught and are preceded by as close to a written warning as you'll ever get from a bike. Except on ice, when slides are impossible to catch but instead result in a practical demonstration of the crash worthiness of a Buell. To save you doing this research yourself, I can tell you that two low speed offs in less than a mile, both while avoiding dozy car drivers in the snow, resulted in precisely no damage whatsoever to the CityX or to me. However there was one major omission that the bad weather highlighted. If ever a bike needed a hugger then this is it. Because having a rear mudguard that has holes in it may look really good but is slightly counter-productive when it comes to stopping water and road crud from getting sprayed up. That's up over the back of the bike, the lights, the indicators and, of course, the rider. My Gortex kit went through the wash every week, the bike got cleaned twice a week just to keep the lights clear and we still looked like escapees from a beach enduro. A hugger would cure most of that, though of course the shorty front guard would still allow the same to happen at that end. in, even after running as long as I dared on reserve. So fuel consumption is pretty miserly. Tyre wear appeared virtually non existent, oil levels didn't change and I didn't need to look at the drive belt at all. Talking to mechanics confirmed my suspicion that Buells are quite easy (and therefore cheap) to work on and that nothing seems to regularly go wrong with them these days. Of course, five weeks riding in all weathers, day and night is a pretty in-depth review. You'd expect to get a warts and all, no olds barred road test which would pick up lots of niggly faults and would generally give an impression of ownership. And this is that report. And you've just read the warts and faults. I couldn't find anything else to criticise about this bike. It started every time, no matter what. It did exactly what I asked of it, no matter what, except for that one very icy morning when physics took over. It went well, stopped brilliantly, handled magnificently and made me laugh out loud more times than I can count. I have a few miles of motorway to cover on my journey and the Buell saved me going to the gym. Erik Buell's patented abs workout replaced Christmas excess with something (vaguely) approaching awashboard stomach in just five weeks. Charles Atlas eat your heart out! Yes, even the worst possible place for a naked bike - the motorway - is bearable on the Buell. The brushguards keep your hands warm and the riding position makes it perfectly possible to hold yourself in place without resorting to a deathgrip on the bars and fighting the resulting weave. To summarise. The Buell CityX is possibly the best commuter machine I have ever ridden. It's perfectly capable of holding its own on A and B roads out of town and isn't outclassed on the motorway, though that's hardly the best place for it. It handles, goes and stops brilliantly, it's comfortable as you like and it looks great. At £5949 it's stupidly cheap and running costs are negligible. The biggest complaint I have about the bike, other than the victory of style over sense in the rear mudguard area, is the fact that Harley Davidson insisted I gave it back.